What Do River Guides Put in Their Ammo Can? When I first began working for Holiday River Expeditions, I had several goals to strive for- not the least of which was obtaining my guide license and some serious river time. I was in my late teens, unloading grocery trucks in the warehouse and dreaming of the day when I’d have a boat and set of oars to call my own while bringing guests down the river with Holiday hospitality that is both typical and renowned. Other rites of passage awaited, taunting me from the end of the tunnel like so many hints and beacons of adventure; a low-profile-cut ‘guide’ life jacket, and awesome river knife and accompanying sheath. One of the most tantalizing benchmarks of professional river life was a symbol of the lifestyle itself; my very own ammo can. 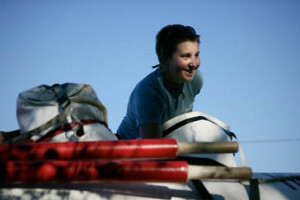 Every ‘real’ river guide had at least one ammo can for personal belongings and medical supplies. These backcountry totes represented to me the hard, rugged life that held some mysterious power over us. Each guide’s ammo can(s) said something about them. The paint job and/or accompanying stickers was a statement about how much or little they took themselves seriously, bumper sticker panels revealed refined tastes in, well, gas station bumper taste, and the more well-traveled guides even boasted chipped paint and coveted “Where The Hell Is Maybell Colorado?” bumper stickers. Like gunslingers of the new west, real guides bristled with river gear and weathered ammo cans of many sizes and shapes. I couldn’t wait to get my hands on one and stock it to the brim with whitewater essentials. After shedding my fair share of sweat in the warehouse, the day finally came when I had an ammo can to call my own. I remember lovingly spray-painting it Holiday Red and White, and feeling a deep sense of pride when the paint began to wear on a particularly satisfying Westwater Canyon trip. I was gaining river miles and river pride. –A first aid kit. 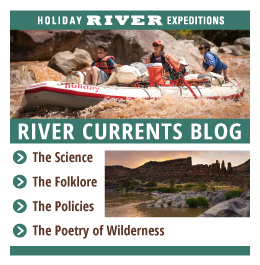 Holiday River guides are required to have, at minimum, a nationally accredited Wilderness Advanced First Aid or Wilderness First Responder certification, accompanied by a fully stocked first aid kit that includes such essentials as anti-bactierial ointment and treatment for everyday boo-boos and the hopefully-avoided but still-anticipated more serious cuts or scrapes. –Headlamp. Laser Light Show. A headlamp is pretty self-explanatory. A fellow guide by the name of Tim Burdick took portable light fixtures to the next level when he brought a personal rotating lazer light projector and busted it out at camp one night. The luminescent patterns played across the trees at camp like some alien fireworks show and we probably could have been entertained for hours had exhaustion not trumped amusement. -Channel Locks. Another quintessential river guide tool, and an absolute must-have when it comes to dutch oven cooking (by the way, Holiday lasagna remains one of the best meals I’ve ever had in my life). –Deck of cards. Sometimes the camp vibe just calls for a good old-fashioned game of cards. Some high school kids on a youth trip showed me several of the coolest magic tricks I’ve ever seen (and have never been able to duplicate). -Knot book. As a climber, I ended up with this one by default. It was great to bring along a piece of cordallette and refresh some knots on the drive to and from the launch or take-out. These were some of my essentials and things any self-respecting guide won’t be caught without. But ammo cans certainly weren’t limited to these items. Some guides got even more creative. More on that later. In the meantime, Go With The Flow.